The British Columbia Water Buffalo Producers Association (BCWBPA) consists of three water buffalo farms and one specialty cheese manufacturer, all in the fertile valleys of Vancouver Island. Our goal is to educate people about the unique benefits of local water buffalo products. The first water buffalo in Canada arrived at Fairburn Farm in Duncan on Vancouver Island in 2000. Since that time, the love has grown... You simply can't help but connect with these gentle animals. Ethical and sustainable practices for both animal care and food product handling along with a majority grass-fed diet—on one of the most beautiful coasts in the world—allow for our family owned and operated farms to produce only the highest quality milk and meat. At BCWBPA, not only are we crazy about our water buffalo, we are excited about the future. 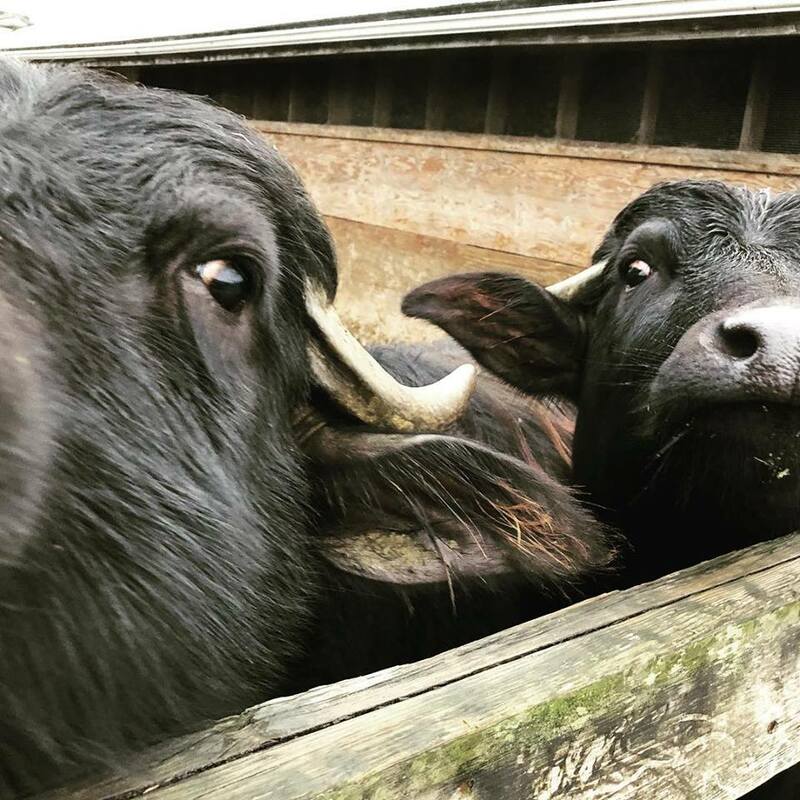 Water buffalo products are an innovative, niche industry with all of the elements required for success now and in the future: enthusiasm, experience, youth, ethical farm practices, healthy food products and, well, just about the coolest animals you will ever meet. Located in Langley, BC’s Lower Mainland, a grass-fed dairy and meats. Tesfa Farm is operated by Brad Bennik and his family. Tesfa Farms can be found at Langley Farmers Market most Saturdays! Visit Tesfa Farms on Facebook! Located in the beautiful Alberni Valley. Coleman Meadows Farm is home to a herd of 100% grass-fed happy Water Buffalo. They have an on farm market open year round Saturdays 10-2. Extended hours in the summer. Visit Coleman Meadows Farm on Facebook! The Comox Valley is home for this 4th generation family farm, an idyllic setting for this herd of 100% grass-fed Water Buffalo.. Surprise your palate with a simple but profound taste of cheese made from water buffalo milk.